Beng Mealea was built in the Angkor style and is located about 40 km east of the main group of temples at Angkor in Cambodia. It was built as a Hindu temple, but there are some carvings depicting buddhist motifs. Its primary material is sandstone and it is largely unrestored, with trees and thick brush thriving amidst its towers and courtyards and many of its stones lying in great heaps. For years it was difficult to reach, but a road recently built to the temple complex of Koh Ker passes Beng Mealea and more visitors are coming to the site, as it is 77 km from Siem Reap by road. Like Ta Phrom the Beng Mealea temple has been overgrown extensively by the jungle but unlike Ta Phrom you can explore this temple without the many tourists you get at Ta Phrom and the other Angkor temples. 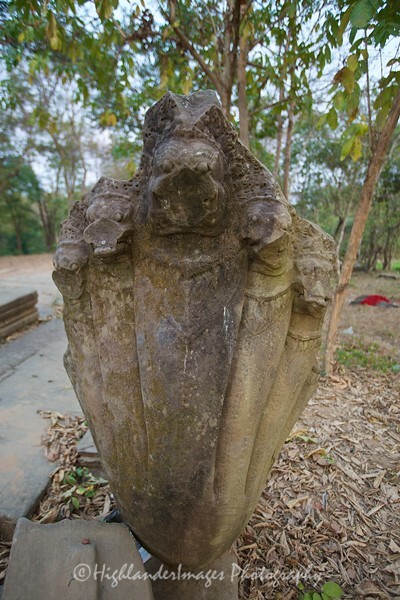 Beng Mealea is oriented toward the east, but has entranceways from the other three cardinal directions. The basic layout is three enclosing galleries around a central sanctuary, collapsed at present. The enclosures are tied with "cruciform cloisters", like Angkor Wat. Structures known as libraries lie to the right and left of the avenue that leads in from the east. There is extensive carving of scenes from Hindu mythology, including the Churning of the Sea of Milk and Vishnu being borne by the bird god Garuda. Causeways have long balustrades formed by bodies of the seven-headed Naga serpent. It was built mostly of sandstone: Beng Mealea is only 7 km far from the angkorian sandstone quarries of Phnom Kulen, as the crow flies. Presumably sandstone blocks used for Angkor were transported along artificial water canals and passed from here. Despite of lack of information, the quality of architecture and decorations has drawn the attention of French scholars just from its discovery.